The fittings used in gas piping are similar to those employed in steam work, such as couplings, elbows, tees, crosses, etc. (see Fig.. 25, 26, 27 and 28). Other fittings not so extensively used are the union, the flange union, the running socket and right and left couplings. Fig. 29 shows a screwed union and Fig. 30 a flange. 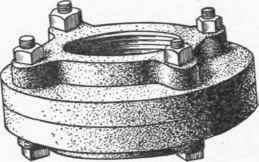 These fittings are of cast iron, or of malleable iron, the latter being preferred for the smaller sizes. Fittings may be either galvanized, or rustless, as in the case of pipe, and it is especially necessary that they be free from sand holes. In making pipe joints the gas fitter should make use of red lead, or red and white lead mixed, to make up for any possible imperfections in the threads; this, however, should be used sparingly so that the pipe may not be choked or reduced in size. The use of gas fitters' cement should be prohibited. It is important that each length should be tightly screwed into the fitting before the next length is put on. It is always a wise precaution to examine each length of pipe before it is put in place, to make sure it is free from imperfections of any kind.